Superman, Supergirl, Steel and Superboy stare in disbelief as Eradicator dies before them. 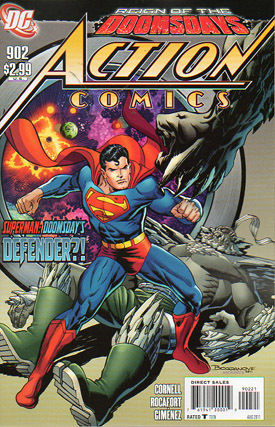 Superman leaps at Doomslayer and questions his origins but is hurled to the floor as Doomslayer points out his regret at killing their friend, but his inherent beginnings mean sometimes his rage overcomes him. He proclaims that he will erase Luthor's clones and the original, firing a killing laser blast. Superman leaps in front of it protecting his comatose former slayer and makes a proclamation of his own. No one will die today. Doomslayer shrugs off the bravado and tells them the ship is on course to destroy the Earth no matter what they do. On Earth Jimmy and Lois stare skyward hoping for Superman's return and it looks like it's sure to happen as the team hack the ship's airlock. Grabbing Doomsday, and then hurling him to Earth, the four heroes head out and formulate a plan. Steel implants Cyborg's egg node into his chest and distributes his Nanites so the team can talk and hear in space. With all their might, they push the ship back fighting against its powerful engines. They can't stop the ship, but they can slow it enough so that Earth wont be destroyed. Doomslayer, realizing his plan has been foiled, instigates his back up. Superman stays to continue slowing the ship but sends the rest of the team back to Metropolis to help with the relief effort when the ship impacts. 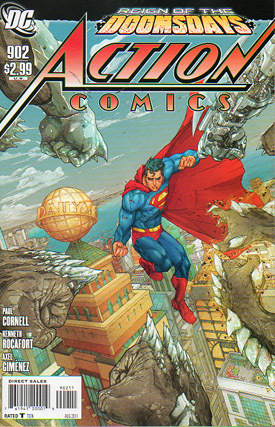 Ground Zero is Hobs Bay and the resulting tidal wave takes the full force of Kara's arctic breath, Superboy's tactile telekinesis and Steel's Gravitron Source to stop it. Miraculously they succeed and out of the water limps a weakened but triumphant Superman. The victory is short lived as Doomslayer emerges from the ship and vows that the Doomsday clones will finish the job he started. Story - 1: Such high hopes... dashed at every turn. The previously inescapable ship is suddenly easily hacked. Steel is able to defy science with his magical nanites and make the team speak and hear in space. The three Doomsday clones sit back doing nothing until the last page. Doomslayer suffers from expository verbal diarrhea. Suspension of disbelief is a given in a book about a man who can fly and bend steel bars, but since the start of the arc there have been a series of ridiculous story twists. Eradicator dies in the blink of an eye, Cyborg is turned into an egg... The list of silliness goes on and on. This anniversary story is horribly executed and if permitted I would rate this a zero. I can only hope that with a matter of weeks before Superman's adventures end that the story gets better. Art - 3: The art is a saving grace, at least to halfway. The intense pencil lines and bright digital coloring accentuate the scenes and give it the meat it desperately needs. I would have given it a five but then from page 13 the artwork just doesn't work. The tidal wave doesn't look anywhere near as devastating as it should nor does the team's gargantuan efforts to stop it. And the splash page at the end, just looks heart wrenchingly bad. I realize I'll probably cop some flack for being so negative but this is Superman, not Dr. Who. Cover Art - 4: The cover looks great. Superman is about to fight four times the evil that once killed him, if it only reflected the story inside I'd be one happy reader. Variant Cover Art - 4: I love this cover. It was like traveling back to the time when Death of Superman shaped comic book history. Superman looks ready for a real fight!